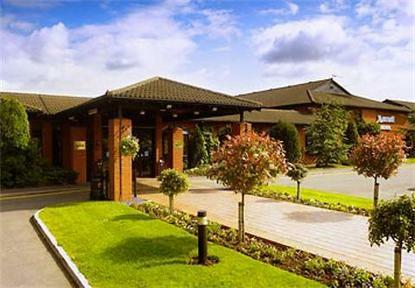 Located within the heart of Northamptonshire, set amongst landscaped gardens and overlooking a peaceful lake and adjacent to Delapre Golf Course, The Northampton Marriott is easily accessible from the M1 and A45. With an abundance of great attractions, fantastic shopping and a huge range of activities either on site or nearby, there's something for everyone. Enjoy a first class meal in the elegant and relaxing surroundings of the Mediterrano Restaurant where the menu features a wide range of European dishes accompanied by friendly first class service. For something a little lighter visit Chats Cafe Bar where you can relax with a newspaper over a cappuccino, enjoy a club sandwich or treat yourself to a traditional afternoon tea. With a range of Versatile function rooms accommodating up to 220 delegates, as well the Marriott Management Centre which is a self contained business centre, we can cater for all your requirements from intimate private dinners to large scale banquets and conferences.